Processing of bungs (electrometric closures for drug containers) is of high concern since they play a significant role in the quality and life of the final product. The need for correct processing technology is even more important considering the complexities in the compounding of the rubber used for the closures and the non-compliance to GMP by the manufacturers of the electrometric closures. Considering the criticality of bung processing, our engineers at Machinfabrik with over 20 years of varied technical experience developed a unique 5 in 1 approach as against the conventional method of closure processing. Rotating carriage: Since uniformity of operation on the entire lot of bungs is critical, we have designed the rotating carriage that has a triangular cassette sections with perforated sides for hooking the bungs. Sprinkling manifold: The machine is provided with sprinkling manifold arrangement over the rotating carriage that enables uniform sprinkling over the entire lot. Fluidisation manifold: For rigorous fluidization in the processes of washing and rinsing, the Fluidization manifold causes turbulence in the water soaked bungs for effective cleaning. The stages of bung processing that will be addressed will be loading, washing with detergent, rinsing ,siliconization , sterilization and drying. 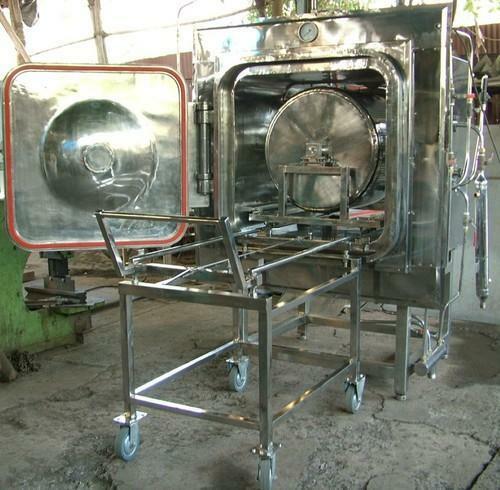 The loaded bungs are washed with detergent solution via a fully automatic detergent dozing system. The washed bungs are rinsed with deoinized water .that makes the bungs free of particulate matter . After cleaning the closures are siliconized using a silicone emulsion or oil. Siliconization of closures is necessary to prevent the release of plasticizers and other compound added during the compounding of elastomeric closures, to prevent any reaction between the closure and the medication stored or to ensure smooth operation of the machines used for bunging. The closures are then sterilized with steam. A pre-vaccum process is employed to ensure effective removal of air and penetration of steam. After sterilization the closures are dried using a vaccum drying process. The drying efficiency is further improved by the continuous rotation of the closures. Process ensures bone dry closures on unloading. Triple Punch Cleaning system is implemented to ensure through cleaning and sterilization of the closures. This would comprise of the three sub stages mentioned here. A fluidization system with sterile air for mild turbulation of the closures. An overflow system for removing the floating scum and dirt removed from the closures. A recirculation system with filtration for eliminating the dirt released during the process. This also helps in conserving the different process mediums thereby controlling process cost. Facility to sample drain water and hence select further cycles or to repeat washing till satisfactory. User defined rinse time and soaking time for the bungs. 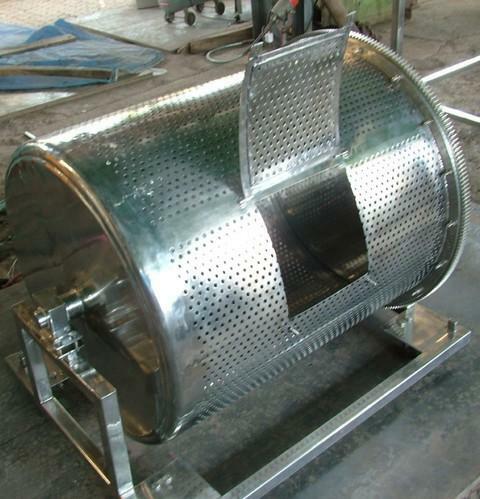 The BUNG PROCESSOR is fitted with a Clean In Place (CIP) system for washing the chamber and the rotating carriage to prevent the dirt released during one phase from being carried over into the subsequent phases. This is particularly important before the start of the "Rinse with purified water" and "Sterilization" phases. We have successfully developed friction drives which prevent direct metal to metal contact for superior process hygiene. Specially developed plastic gears are used which ensures no particle generation during the process and allows the absence of any lubrication. A special non-lubricated mechanical seal is also used for pressure and vaccum tight operation of the driving system. The BUNG PROCESSOR is designed for a unique dual operation. This not only saves additional investment but also space, which is critical in any Pharmaceutical facility. 6) Safety Valves for Chamber and Jacket. Door Obstruction- the door will not open when the chamber is pressurized. Both doors will not operate simultaneously to protect the integrity of sterile chain. Used extensively in pharma and rubber industry . The BUNG PROCESSORS can also be supplied with a Mobile LAF for unloading of the closures. This ensures loading and storage of the stoppers under a CLASS-100 environment till the point of use. The Mobile LAF is a battery-powered unit which can be docked to the BUNG PROCESSOR for unloading the Rotating Carriage. Design also allows the Mobile LAF to be easily maneuvered around the sterile area. It is also possible to connect the Mobile LAF to a 110V/230V AC power supply when the stoppers need to be stored under the LAF for an extended time duration.